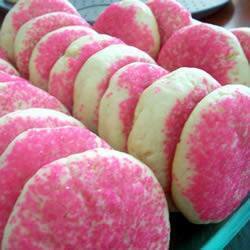 These are the big, soft, and puffy cookies you remember…………yum!!! Cream shortening and sugar til smooth. Add eggs and beat with mixer. add vanilla. Add four mixture (dry ingredients) a cup at at time, alternating with buttermilk until both dry and liquid are mixed. Dough will be slightly sticky. Refrigerate dough for several hours, and then either roll out and cut or roll into balls. I roll into balls and coat balls with sugar, place on greased cookie sheet and flatten slightly. Bake at 375 for 15 min ( length of time depends on size of cookie the smaller the cookie the less time needed).